HIKIFUDA.COM: Recent addition: antique hikifuda, "Two Lucky Gods"
Recent addition: antique hikifuda, "Two Lucky Gods"
Recently listed in our online shop. An e-bira-type hikifuda. 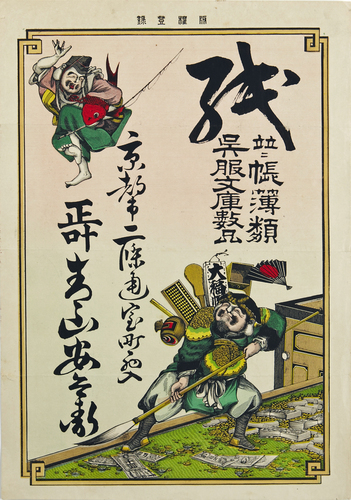 Two Lucky Gods, one making a big leap, the other standing over a pile of money while holding a large calligraphy brush. Beautiful antique Japanese advertising poster from the late 1800's, early 1900's. Listed in the "Lucky Gods" section of the store, accessible through the navigation bar above.